Plant roots rely on local production of a key hormone that controls many aspects of development and response to environmental changes, according to new research from North Carolina State University. The study sheds light on the importance of when and where the plant hormone auxin is produced and explores the interplay between auxin synthesis and transport that moves auxin throughout the plant. Specifically, the research shows that local auxin production is required to keep plants healthy. That is, roots will degenerate if auxin is not produced in the root, or flowers will be sterile if auxin is not made at the right place and the right time in the flower, despite the fact that the hormone can be transported throughout the plant. "We knew how auxin was transported within the plant and how plants respond to auxin, but surprisingly we didn't know until recently how and where auxin is produced by the plant," said Javier Brumos, an NC State post-doctoral researcher and first author of a paper describing the research. Early hypotheses about auxin transport posited that the hormone was produced in young leaves and shoot tips and worked its way "down" the plant into stems and roots to promote plant development and growth. 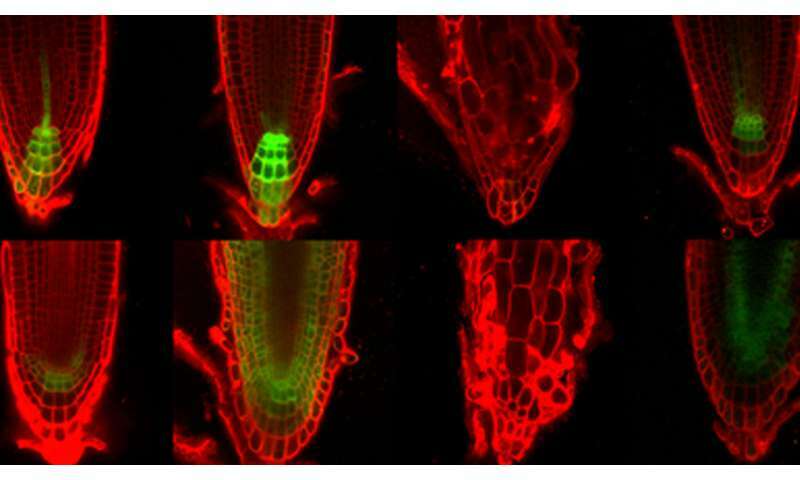 Later research revealed the molecular machinery that makes auxin and demonstrated local auxin production and movement between cells in roots as well as shoots. "That led to the question of how important local production of auxin in the root—that is, auxin that moves from root cell to root cell rather than being transported from the shoot—is to plant development," Brumos said. Using a variety of elegant experiments on Arabadopsis, or mustard weed, the NC State researchers showed the importance of local auxin production in plant roots. First, the researchers created hybrid plants by grafting healthy, auxin-producing shoots onto roots that didn't produce auxin to see whether auxin could be transported from shoot to root to keep roots healthy. Roots degenerated when no locally produced auxin was available. The researchers also performed the opposite experiment, grafting auxin-less shoots onto auxin-producing roots. Those roots were viable and healthy. Next, the researchers placed a paste of auxin on shoots of auxin-deficient seedlings to see whether auxin could be transported to roots to maintain healthy roots by activating stem cells located in root tip tissue called the meristem. While this auxin paste helped create some new roots, those roots soon degenerated. "It turns out that plants may choose to make auxin in the place where they want it to accumulate rather than always bring auxin from other parts of the plant," said Anna Stepanova, an assistant professor in the Department of Plant and Microbial Biology at NC State and corresponding author of the paper. "Locally made auxin is necessary for keeping the stem cell niche alive. If there is no local auxin in the root, the plant loses its root meristematic activity and the root degenerates." The researchers also blocked a plant's natural ability to produce auxin with specific chemical inhibitors and instead inserted bacterial genes known to make auxin. The bacterial genes could then be activated to produce auxin in either roots or shoots at will by applying heat. Again, plants with root-made auxin had viable roots, while plants reliant on auxin transport from shoots had faulty roots. The paper also more closely examined auxin production and transport outside and within roots, showing that externally applied auxin could save auxin-starved meristems if auxin transport systems in roots were functioning. But if auxin transport was blocked in root cells, the health of the roots became reliant on local auxin production: If the hormone was not made in the right place at the right time, the roots withered and died. The researchers also examined the role of local auxin in flowers and leaves and again saw that the sites of the biosynthesis of this hormone are critical, in this case, for full fertility and normal leaf development. "The take-home message of this study is that local auxin production and transport work together to keep plants healthy. Through this cooperative action, plants can maintain robust stem cell niches and thus can survive and grow even in harsh conditions," said Jose Alonso, an NC State professor of plant and microbial biology and an auxin expert, who co-conceived the study along with Brumos and Stepanova. More information: "Local auxin biosynthesis is a key regulator of plant development" Developmental Cell, 2018.